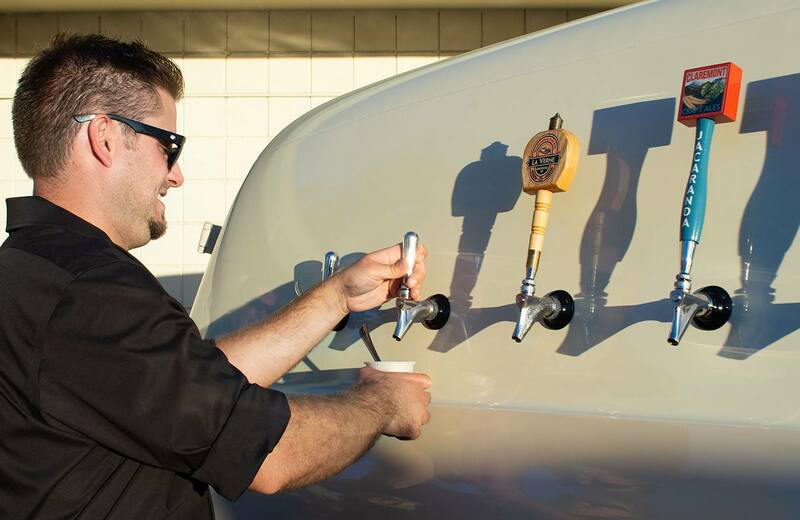 The event featured beer stops from breweries across Southern California, food stops from local restaurants and a variety of live music acts. The event was organized and hosted by the Old Town La Verne Business Association, who were inspired by the success of the annual Sip of La Verne wine walk. “We do a wine walk every year and we decided other cities do beer walks, so why don’t we do a beer walk?” Micky Rehm, owner of Micky’s Jewelry and commissioner of the Old Town La Verne Business Association said. The addition of a beer walk welcomed even more La Verne residents who have never attended the wine walk. “We’re not wine drinkers, we’re beer drinkers” said long-time La Verne resident Martha Knight about herself and her husband, Darrel Knight. Tickets for the event were $40 during pre-sale and $45 in the week leading up to the event. Tickets were sold in person at Micky’s Jewelry Studio and Duds and Doodads, and online through Eventbrite. Participants in the walk received tickets for 12 four-ounce beer pours, unlimited food tastings and a commemorative glass that was used for the beer tastings. Upon registration participants were given a wristband and 12 tickets to be used for tastings. Participants were able to use their tickets on any beer stop of their choice simply by dropping their ticket in a bucket and handing over their commemorative glass. Attendees were able to repeat visit the same beer stops, though only one sample could be given at a time. Those who wanted to enjoy the festivities but not the alcohol, were able to purchase designated driver tickets for $20 during pre-sale and $25 the week prior to the event. Designated drivers were able to receive unlimited food tastings, with a different colored wrist band signaling they were not going to drink any alcohol. The Old Town La Verne Business Association announced that a portion of the proceeds from the event would go to the local La Verne non-profit, David and Margaret Youth and Family Services. Sixteen breweries participated in the event, including the La Verne Brewing Company and new D Street Square resident Alosta Brewing Company. Most old town businesses that participated in the walk were paired with a food vendor and a beer stop. Although some businesses, like D Street newcomer Café Wang, only served as a food stop. The beer walk provided a mutual benefit by bringing foot traffic to the Old Town businesses and an audience for the food and beer vendors. “I was really excited for this event, we get to show off our Marzen which is a traditional Oktoberfest beer,” Bob Zedler of the La Verne Brewing Company said. While all beer pours were the same size, food tastings varied wildly from vendor to vendor. Some restaurants like Fourth Street Mill set up self serve chafing trays of bbq ribs. El Merendero food stop featured a fully staffed grill serving el pastor, asada, and chicken street tacos, rice, beans and chips. Pappas Artisanal brought back their jambalaya which received rave reviews at the wine walk and is now being added to the menu. La Verne On Tap spread down D Street from Bonita Avenue to past Third Street with 26 separate beer or food stops and 11 live musical acts. With the success of the inaugural La Verne on tap event organizers hope to host the event annually.